Yesterday I had my first proper attempt at teaching my 7 year old daughter programming. This is done using the Raspberry Pi with Scratch and the Official Raspberry Pi Programming Manual produced by Computing at Schools. Biggest problem we found was that due to the bedroom TV being wall mounted it was at the wrong height / position for working on as a computer screen. Will need to work on a proper solution in future, but managed for now creating a temporary table and pointing the TV down. First I updated the SD card to a dual-boot option using BerryBoot so that we didn't have to swap out SD cards from the XBMC media player she's been using the Raspberry Pi for so far (more on BerryBoot in future as it's quite useful). We only had a small time to work through the programming, but then it's perhaps better done in small regular chunks rather than trying to teach it all at once. 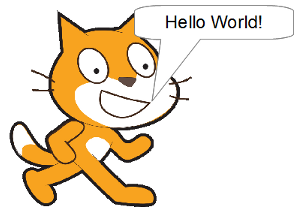 So far we got the Scratch cat to say "Hello World" and change the amount of time it's displayed for. She was enthusiastic about it, enjoyed what we did and is looking forward to our next session. She's even trying to think about what games she may be able to create thinking about the features in the games she plays on her Android tablet. For me it was a different experience to what I'm used to. As with many parents I have helped my daughter to learn new skills and help with school work, but not structured teaching in the same way as I'm trying to with using the Raspberry Pi Manual. I've also provided training to adults and children in a more structured environment (work and volunteer related). Teaching your own child using this manner is something different. Perhaps it's because I've already introduced her to Scratch running on a Linux laptop (whilst waiting for my first Pi to arrive and before the educational manual was available), but the hardest thing so far is trying to keep on-topic. We're both looking forward to the next session which is certainly a good sign.